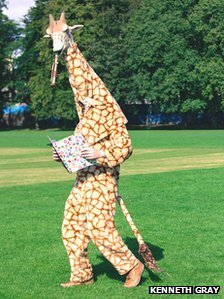 Let me introduce you to Armstrong the Good Giraffe. Appearing in the news last week due to his goodness (and probably his giraffeness), Armstrong is a man in a costume who goes around voluntarily doing good deeds. Throwing himself into helpful tasks – such as providing free water and bananas to runners, picking up litter from beaches, and cleaning cages at cats and dogs homes – Armstrong clocks up an impressive number of non-trivial good deeds. Most impressively of all, he reportedly enjoys it. He comments that doing these good deeds makes him feel ‘happy’ and ‘cheery’ and that this is why he does them. At first glance, this may make us think he is particularly remarkable: he not only goes about investing more time and energy into being helpful than most would reasonably expect of a person, but he also relishes it. But, I want to ask, are people like Armstrong really at the top of the moral ranks? Is there not something about effort – about having to try – that we value? Imagine the following scenario: you are moving house and need help to transport your possessions from your old house to the new one. Two friends help you to do this, driving between the houses all day. One of them does so eagerly, barely noticing the hours that pass in your service. The other does so with inner frustration (although he does not tell you this). He experiences helping you as a burden but helps regardless, because he knows he should. Is the first friend definitely morally better? Is there anything about the effort it requires for your second friend to do ‘the right thing’ despite experiencing it as a burden that we might actually value? My intuitions, at least, seem to equivocate. We can visit two philosophers for help. For Kant, what is important is that a person acts out of duty, not out of inclination. That is, a person must do the right thing simply because it is the right thing – because she respects the moral law – and not because it makes her feel good or because she hopes to gain something from it. This would seem to speak in favour of the value of effort in moral action: if doing the right thing is experienced as a burden and requires effort then the person must be really committed to doing the right thing for its own sake. From an Aristotelian perspective, things look different. According to virtue ethics, a person is at her most virtuous when her emotions and desires are in line with what reason should calculate as good. Thus, a moral virtue is a disposition to act as the morally reasonable person would act and to feel emotions and desires appropriately. For Aristotle the moral ideal is to not only to do the right thing, but also to want (in a basic sense) to do it, and to experience it positively. On this account, experiencing doing good as burdensome is less virtuous than enjoying it. Perhaps equivocation over the moral value of effort can be somewhat resolved. Given that we intuitively value effort, but do not (I think) want a world in which everyone goes around doing the right thing begrudgingly, we can develop a perspective that accommodates both intuitions. Perhaps the agent whose actions have the greatest moral worth is one who is disposed to do the right thing, but who acquired such a disposition through effort. Effortlessness then is a result of effort. This may actually be quite close to Aristotle’s overall picture of virtue: as something that one develops. It also retains Kant’s intuition that acting out of (intellectual) commitment to the good is better than following simple inclination and maybe getting it right (without fully intending to). If one has to exert effort to end up with the right dispositions, one must begin with an intellectually-arrived-at set of ‘good’ dispositions to cultivate. It is interesting to compare the moral value of effort with how we value effort in other domains: do we see as more praiseworthy the genius mathematician who reaches solutions at lightening speed, or the mathematician who reaches the solution eventually, after gruelling hours at his desk? We certainly admire (perhaps wonder at) the genius capacity, but which man do we admire more? Does the same ‘trained effortlessness’ argument have any purchase here? I don’t at all claim to have answered the puzzle, and there still seems to be something about the Born Saint that fits a common conception of the ideal moral agent. In addition, difficulties in distinguishing intrinsic from extrinsic motivation, and how this effects our intuitions complicate the matter further. Armstrong might be motivated to clean beaches because of the way he feels after he’s done it, and because of the praise he receives. This motivation may be driving him through a real hatred of litter collecting. Ultimately, it might not matter how we feel about what we do – how much effort it takes us – as long as we do the right thing. Either way, Armstrong the Good Giraffe sets an impressive example. However it assumes free will. If free will is an illusion then we can still admire the act, but seems strange to admire the agent because he/she could not have done otherwise. Most ethical systems (and thus, posts about ethical systems) are going to make (1) some assumptions in general and (2) especially some assumptions about free will. It’s no fault of the author that she does this.